There seems to be silence from the Wicklow County Council so far, without acknowledgement of our submissions or retraction of the Plan 8 process. It is a week after the closing of objections and silence. It is important that we have a position soon, because the intention is to hold the first meeting of the River Vartry Protection Society and invite the councillors for a portion of the time to make sure they are informed of all that is happening. Sometimes there is a disconnect between what the office does and what is reported to the Councillors. It is important that they do not only rely on the information supplied in the Manager’s Report on submissions, but hear first hand from members of the public. This will still be important even if the Plan 8 is temporarily withdrawn, only we will have more time to arrange in that case. The Wicklow Co. Co. has commissioned McCarthy Hyder to do a simple study. McCarthy Hyder had originally advised the WCC that an environmental study was not necessary. It is our opinion that this advice was not in the best interest of the River and that the eventual author of the EIA will be someone that exhibits a bi-partisan concern over the river and that the process is monitored by An Bord Pleanála, the Fisheries and the EPA. There is rumour that the Wicklow County Council is going to rethink the Plan 8 process and withdraw it for the time-being until they have produced an EIS and fixed some of the issues raised. We understand that this was only to be done last Friday, so (I imagine) they could judge the magnitude of the response and what were the subjects of the complaints. This will be very welcome news and will hopefully be a step towards resolving this in favour of the River. We are pleased that you have reconsidered and have listened to the Public on this. Just to make it clear, an EIS produced by McCarthy Hyder as outlined in your planning documents will not be considered sufficient by the public. McCarthy Hyder is to closely associated with this scheme to be an unbiased party. Before submitting this Planing again, we would like a full EIA according to EU Guidelines..
Planning and Development Act 2000 and the Planning and Development Regulations 2001 (in the case of all other developments). 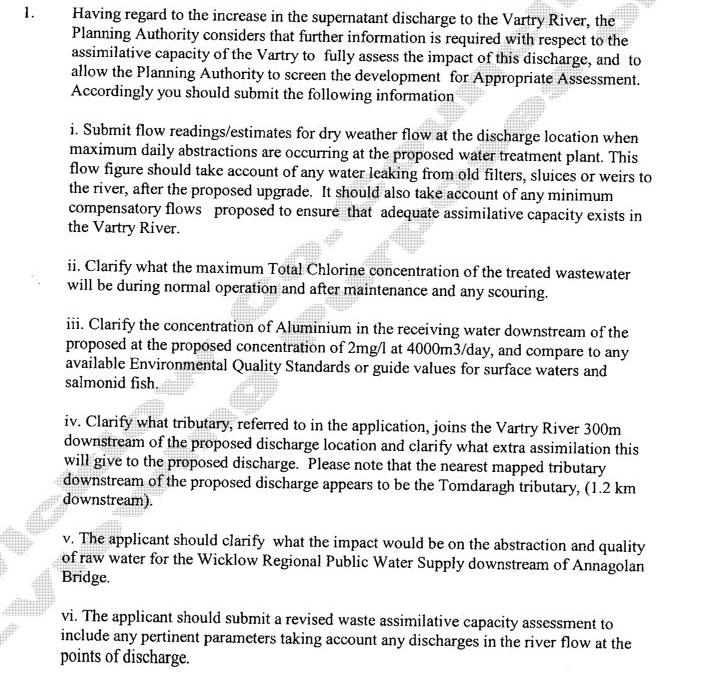 The Wicklow County Council have already commissioned an Environmental Study from their contractor McCarthy Hyder and this would not be sufficient. We are still really seeking that the deciding force on this is not Wicklow County Council but An Bord Pleanala and experts from the Eastern Regional Fisheries Board and the EPA as well as public participation. 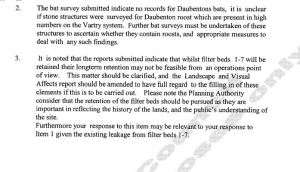 It is hard to believe but the Wicklow County Council has denied Freedom of Information Access to an PUBLIC important document which is the Ground Source Protection Study. The formal decision was given on Tuesday the 10th of February at 5:00 pm. Not including the study was injury to the public. Refusing an FOI request making it so that this study will only be available after an appeal and after the deadline is dishonest. We work hard to cooperate with the Wicklow County Council and not turn into adversaries, but with such decisions as this, it is hard. This study delineates just who will be restricted in the use of their own property. There are going to be many people who are unaware that they are in the protection area. These will be some who are going to be forced to change to main sewers, restricted in using any gardening poisons, and for some who farm, will be unable to continue due to restrictions on spreading of fertilizer either organic or chemical. If you draw a 300 meter circle around each of the wells, you will probably catch most of those effected. That is many new objections. If you are in this area, please urgently draw up an objection and deliver it to the Wicklow County Council. If you need any kind of help, just email admin(at)rivervartry.com and we will get back to you at once. The Hydrogeological Assessment Study released by the Wicklow Co. Co. under Freedom of Imformation spells out clearly that the River is under threat. The complete study is available under Important Links both “Complete Hydrogeological Assessment” and “Summary Hydrogeological Assessment” (containing the most damning information). 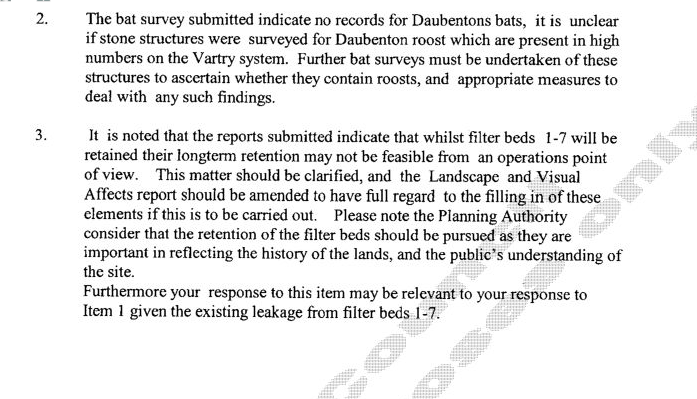 Here is just one quote, “...an assessment of the potential impacts of any reduced water levels and flows in the Vartry River may have on the fish populations and other protected species will be examined and a separate report will be prepared if necessary.” Please add your objection to the growing list of neighbours that have already objected. 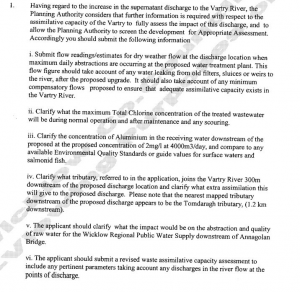 The Eastern Regional Fisheries Board has added their objection to the list of objections to the Wicklow Water Scheme. You can read the complete objection clicking on this post or under important links: Eastern Regional Fisheries Board Objection. We still need YOUR objection on the Water Scheme by the 13th of February. We have almost convinced the Wicklow County Council to “do the right thing” but they need to see the amount of people concerned and your objection may be the ONE more that will matter.